Rāwinia Higgins, Poia Rewi and Vincent Olsen-Reeder launched this series of reports from the Te Kura Roa research programme in June 2017. 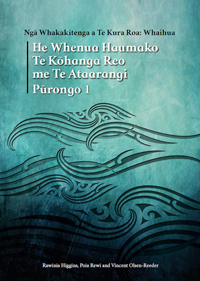 The reports were presented to Te Kōhanga Reo and Te Ataarangi, with findings from the ‘Whaihua’ research project which was first initiated in 2010. The Māori economy is often defined simply by the contributions of Māori in New Zealand in the areas of farming, fisheries and forestry. This book explores the ways that Māori in the privatised military industry contribute in monetary and non-monetary ways to the Māori economy. This book received a publication support grant (PSG) from NPM, and makes a connection between the global and the local, between the political and the personal - and encourages us to take control over the food security of our whānau, providing practical advice on how to grow kai traditionally and in a kaupapa Māori way. Home: Here To Stay is a collection of essays exploring subjects such as migration, ageing and dying, and the meanings of home to Indigenous and colonised peoples. This collection of 12 academic essays considers understandings of home and the impact of dominant societies on indigenous societies and their homes. The book covers home and language preservation, homelessness, retention of land, tobacco use in the home, loss of home through trauma and natural disaster, ageing and health, and the meaning of home. Sociocultural Realities: Exploring new horizonsexamines sociocultural approaches in the education sector, from early childhood to tertiary. With few publications covering such a range, there is a common struggle to gain a better understanding of the impact of social and cultural discourses on learning and teaching; this book aims to encourage the discussion and application of the theory and practice by researchers, policy-makers and teacher educators in Aotearoa New Zealand, Australia, Canada, and elsewhere. The landmark UNESCO publication, Agree to Differ, was launched on Tuesday 18th May, on Day One of the 3rd World Forum on Intercultural Dialogue in Baku. This book is part of a celebration of the International Decade for the Rapprochement of Cultures which runs from 2013 to 2022. Ngā Pae o te Māramatanga (NPM) accepted an invitation to provide a contribution to the publication and Director Tracey McIntosh has written a section titled ‘Sites of understanding and transformation: Māori and cross-cultural research’. Even though the Māori language obtained official language status some 27 years ago, Māori are still expending energy to revitalise and normalise the language within Aotearoa New Zealand. The challenge for Māori is to win the hearts and minds of mainstream New Zealanders, now and in the future to understand the enormous value of the language to the nation across the board – in education and media, in tourism and the broader economy, and to culture and society. Family Futures has been published by Tudor Rose, a commercial publisher and information provider with considerable experience in UN publishing since 1999 to celebrate the 20th anniversary of the International Year of the Family in 2014. It is a fully illustrated 200-page book with sixty authors relating their efforts in the three priority areas guiding the preparations for the 20th anniversary: Confronting family poverty; Ensuring work-family balance; Advancing social integration and intergenerational solidarity.